54 A-Level Biology mindmap diagrams designed to condense the information, visualise the topic, and take your revision to the next level with whole brain thinking to clarify your thoughts and ace your exams! Whenever you look for revision practice ideas for A-Level Biology, mind maps are mentioned as an excellent way to visualise the topic and really nail down the specifics. Unfortunately, creating mind maps yourself is boring! ???? 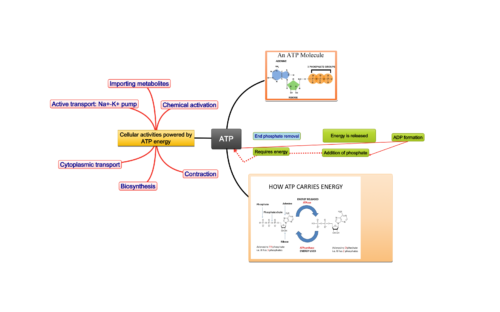 Luckily for you, we have created 54 mind map diagrams to cover the major revision topics that will be on your A Level Biology exams. These can be used whether you are studying the AQA, Edexcel or OCR examination board. Why do mind maps work so well as a study tool? They engage you in whole brain thinking and allow you to see the big picture (how all the different ideas are to connected to one another). They will help you to clarify your thoughts, simplify complex ideas, memorise information and prevent you from getting bored during revision. Click below to find out more information on how mindmaps can supercharge your revision. With A-levels comes lots and lots of information to revise. How on Earth are you going to retain all that stuff? Don’t get stressed out, get smart and use mind maps – they’re simple, effective and make studying your biology paper interesting, fun and creative. The human brain is a complex and sophisticated information hub with trillions of connections that science has estimated can hold up to 1 000 gigabytes of data. That’s huge, so “my brain is full,” simply won’t cut it. A smart way to revise is to work with your brain, which loves to organise information into related clusters, find links and relationships and loves colour, pattern, symbols and pictures. What distinguishes the brain from a computer is its power of association. It just takes one trigger to conjure up a whole host of related information and that’s where mind maps come in. A mind map uses a central topic or idea and radiating clusters of related information condensed into keywords that are linked with elements such as colour codes or symbols relevant to you, for example. The stronger the association, the better recall you’re going to experience in your exam because you’re leveraging the multiple neural networks you’ve established with language, colour and shapes rather than just trying to remember something you read in reams of notes. Another key advantage of mind maps is deep learning. You’re not just going to regurgitate information for an exam and forget it a week later. Don’t worry if you’re not artistic or don’t have the time to create mind maps, that’s where we come in. A-level Biology has created mind map resources for you with all the important content you could need. Remember to personalise them with your own colours, comments, symbols, patterns and experiences to make them more memorable, and add whatever you need as you progress without having to rewrite scores of notes. Given the choice between reading reams of notes with highlights for hours or engaging your brain with dynamic mind maps of key information that your brain can unlock in the blink of an eye, it’s a no-brainer, isn’t it? Check out our mind map resources and let’s get cracking.